Adnan Farah is Minnesotaa Somali-American and convicted ISIS supporter. 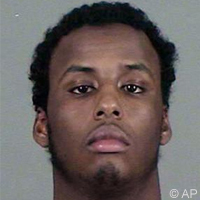 On April 18, 2015, he was charged alongside his 21-year-old brother Mohamed Abdihamid Farah with conspiring to provide material support to ISIS. He and his brother are part of a group of nine Minnesota-based friends who attempted to join the terror group in Syria.Laura Yuen, “3 of 9 Twin Cities men sentenced in ISIS conspiracy trial,” MPR News, November 14, 2016, https://www.mprnews.org/story/2016/11/14/first-day-of-sentencing-isis-trial. Adnan applied for a U.S. passportLaura Yuen and Mukhtar Ibrahim, “For mothers of terrorism suspects, nothing but sorrow,” MPR News, April 23, 2015, http://www.mprnews.org/story/2015/04/23/for-moms-of-terror-suspects-nothing-but-sorrow. in April 2014, citing that he intended to travel to China. His parents confiscated his passport, fearing that he would leave without notice.Laura Yuen and Mukhtar Ibrahim, “Feds charge six Minnesotans with trying to join ISIS,” MPR News, April 20, 2015, http://www.mprnews.org/story/2015/04/20/6-charged-with-trying-to-join-isis. According to the criminal complaint, Adnan was determined to travel to Syria to join ISIS. He discussed these plans with his brother Mohamed, and conspired to obtain fake passports and travel to Syria.Laura Yuen and Mukhtar Ibrahim, “Feds charge six Minnesotans with trying to join ISIS,” MPR News, April 20, 2015, http://www.mprnews.org/story/2015/04/20/6-charged-with-trying-to-join-isis. Adnan expressed his admiration for extremist activities on his Facebook page, where he posted a photo of Anwar al-Awlaki, a Yemeni-American cleric and al-Qaeda propagandist who was killed in a drone strike in 2011.Scott Shane, “6 Minnesotans Held in Plot to Join ISIS,” New York Times, April 20, 2015, http://www.nytimes.com/2015/04/21/us/6-somali-americans-arrested-in-isis-recruiting-case.html?_r=0. Adnan posted photos of the black flag emblazoned in Arabic that is regularly connected to jihadists, as well as a photo of a man holding a sniper rifle and a banner that read, “Among the believers are men who have been true to the covenant with Allah.”Laura Yuen and Mukhtar Ibrahim, “Feds charge six Minnesotans with trying to join ISIS,” MPR News, April 20, 2015, http://www.mprnews.org/story/2015/04/20/6-charged-with-trying-to-join-isis. After being evaluated by German terrorism expert Daniel Koehler while in custody, Farah was determined in September of 2016 to pose a medium to high risk of re-offending.Esme Murphy, “German Expert: U.S. Way Behind In Terrorism De-Radicalization,” CBS Minnesota, September 21, 2016, http://minnesota.cbslocal.com/2016/09/21/deradicalization-expert/. Koehler recommended that Farah receive a reduced sentence and counseling.Esme Murphy, “German Expert: U.S. Way Behind In Terrorism De-Radicalization,” CBS Minnesota, September 21, 2016, http://minnesota.cbslocal.com/2016/09/21/deradicalization-expert/. On November 15, 2016, U.S. District Judge Michael Davis sentenced Farah to 10 years in prison and 20 years of supervised release. Farah expressed his thanks to the authorities who arrested him, saying, “If it wasn’t for them, maybe I wouldn’t be here today.” Farah also told the court that ISIS’s ideology leads to an “identity crisis,” and warned that “there’s kids [sic] going through this now.”Laura Yuen, “Third ISIS sentence of the day: 10 years,” MPR News, November 15, 2016, https://www.mprnews.org/story/2016/11/15/day-2-of-isis-trial. Adnan Farah is Minnesotaa Somali-American and convicted ISIS supporter. “There’s nothing for me in this world, bro.” Laura Yuen and Mukhtar Ibrahim, “Feds charge six Minnesotans with trying to join ISIS,” MPR News, April 20, 2015, http://www.mprnews.org/story/2015/04/20/6-charged-with-trying-to-join-isis.